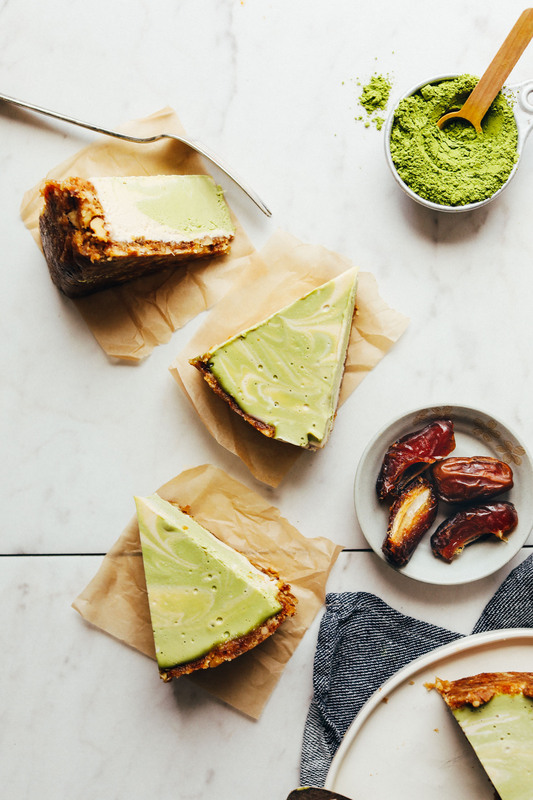 And not just any cheesecake – matcha cheesecake. Let’s do this! This recipe is simple, requiring just 10 ingredients, and adapted from my Easy Vegan Cheesecakes! The crust is made of dates, walnuts, and salt, which creates a salty-sweet, insanely delicious base for this creamy cheesecake. 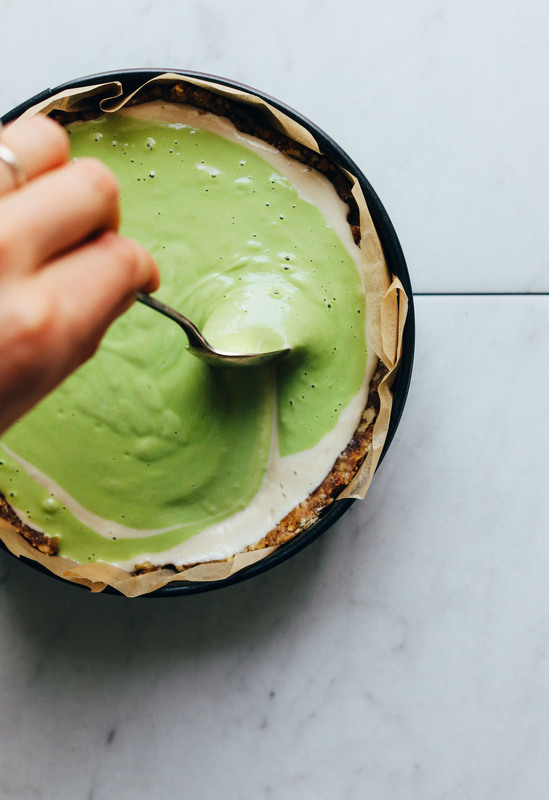 The matcha comes in swirl form. 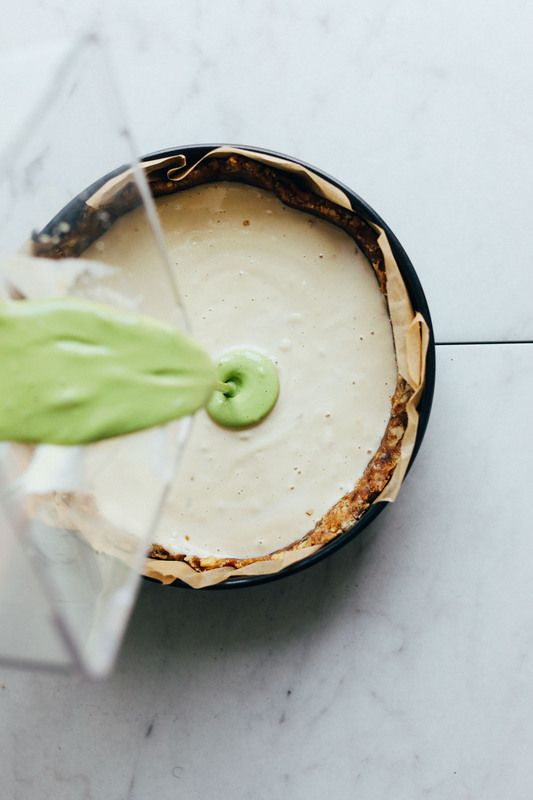 Once most of the filling has been added, add a bit of matcha to the remaining filling and blend. Then pour and swirl. Ohhhh, yeah. It’s not only beautiful, but also delicious. I love using matcha in recipes because it boasts some serious health benefits! It contains an amazing amount of antioxidants. And it provides a gentler boost of caffeine. Find links to my two favorite brands below (one more expensive, one more affordable). Plus, that color! I’d use it for the color alone. Swoon! This would make the perfect dessert for hosting or bringing along to parties. People would never guess it’s vegan and gluten-free! 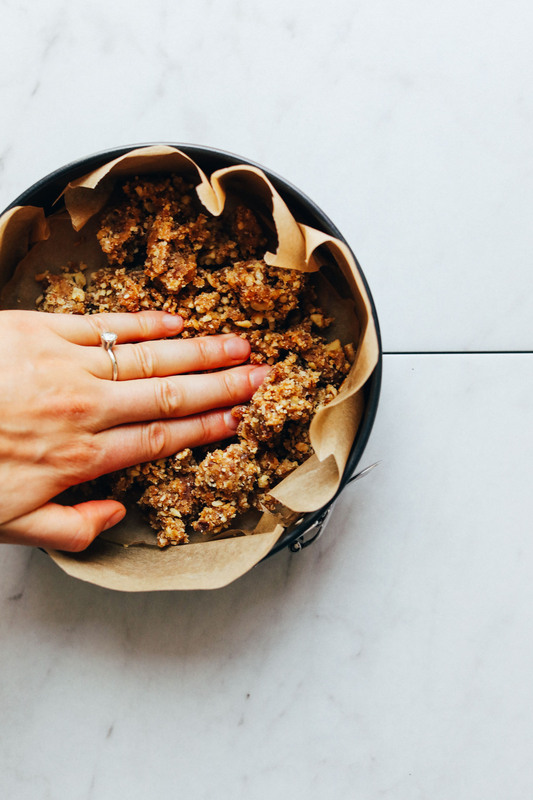 It’s also raw, refined-sugar-free, and super easy to make! Your friends and family will be so impressed with that swirl action that they’ll be begging you for all of your baking secrets. If you like matcha, be sure to check out our Matcha Green Smoothie Bowl, Mint Matcha Shamrock Shake, and Best Vegan Matcha Latte! And for more cheesecake recipes, try my White Chocolate Lemon Cheesecake, Easy Baked Vegan Cheesecake, and Vegan Pumpkin Cheesecake! 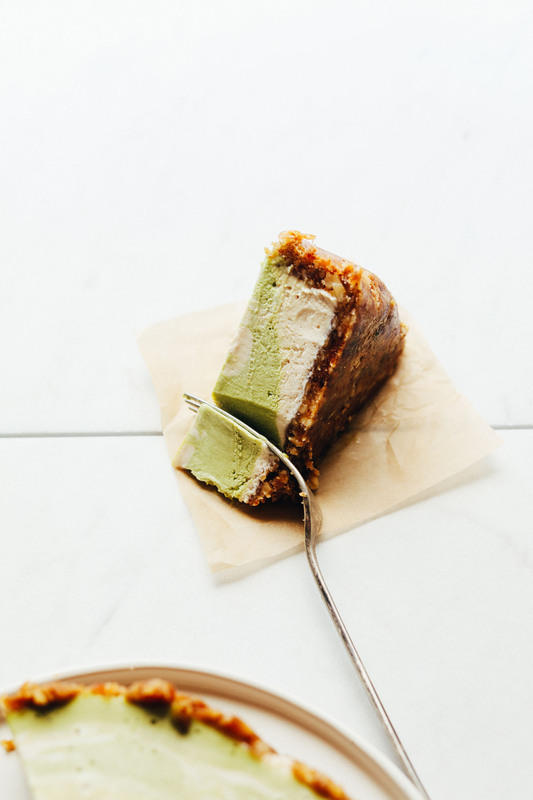 Amazing, 10-ingredient vegan matcha swirl cheesecake that's raw, naturally sweetened, and insanely delicious! The perfect vegan, gluten-free dessert with health perks! Add cashews to a bowl, cover with very hot water, and let soak 1 hour. Or cover with cool water and let soak for 6-8 hours or overnight. Drain well and set aside. Next, add nuts and salt and process into a meal. Then add dates back in and blend until a loose dough forms - it should stick together when you squeeze a bit between your fingers. If it's too dry, add a few more dates through the spout while processing. If too wet, add more chopped walnuts. Line a standard pie, round cake dish, or 7-inch springform pan (I like this one!) with parchment paper (adjust number/size of pans if altering batch size). Then add crust mixture and carefully press with fingers to distribute. To pack it down, use a flat-edged drinking glass lined with parchment paper and really press it down, pushing some crust up the sides. Place in the freezer to firm up. 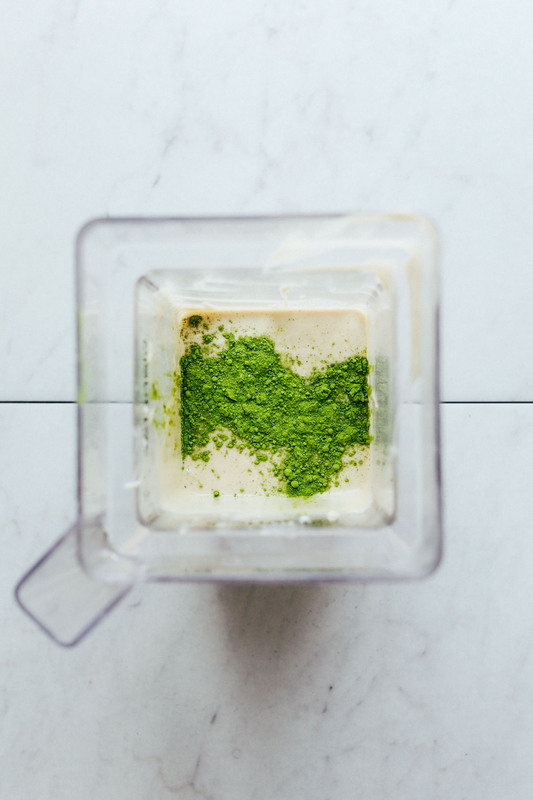 Add all filling ingredients except matcha to a high-speed blender and blend until creamy and smooth, scraping down sides as needed. If it has trouble blending, add a bit more coconut milk. Taste and adjust flavor/sweetness as needed, adding more coconut yogurt or lemon juice for tang, maple syrup for sweetness, or vanilla for vanilla flavor. Pour 2/3 filling into the crust (see photo) and tap a few times to release any air bubbles. Set aside. To the remaining filling, add the matcha powder, starting with the lesser end of the range (1 1/2 tsp as original recipe is written). Blend until creamy and smooth. Then taste and see if it needs more matcha. I found 1 1/2 to be the perfect amount, as too much can taste bitter. Add to the filling in a swirling motion. Then swirl a few times with a spoon or a chopstick to create more of a swirl. Tap on the counter to release any air bubbles. Cover loosely with plastic wrap and freeze until set - about 3-4 hours depending on size of dish. When set, it will be firm to the touch. To serve, set out of the freezer until slightly soft to the touch - about 15-20 minutes. Then slice with a hot knife for easier slicing. Top with a touch of coconut whipped cream and fresh berries, or enjoy as is! Once this cheesecake has been frozen, it can be stored in the refrigerator up to 3 days, but it will become quite soft. For this reason, I recommend storing it in the freezer and setting out for 15-20 minutes before slicing/serving to enjoy the best texture. Store leftovers in the freezer up to 1 month or the refrigerator up to 3 days. *If you don’t have coconut yogurt, sub 1/4 cup more coconut milk and a bit more lemon juice. *Nutrition information is a rough estimate calculated with light coconut milk and without additional toppings. *Adapted from my 7-Ingredient Vegan Cheesecakes. 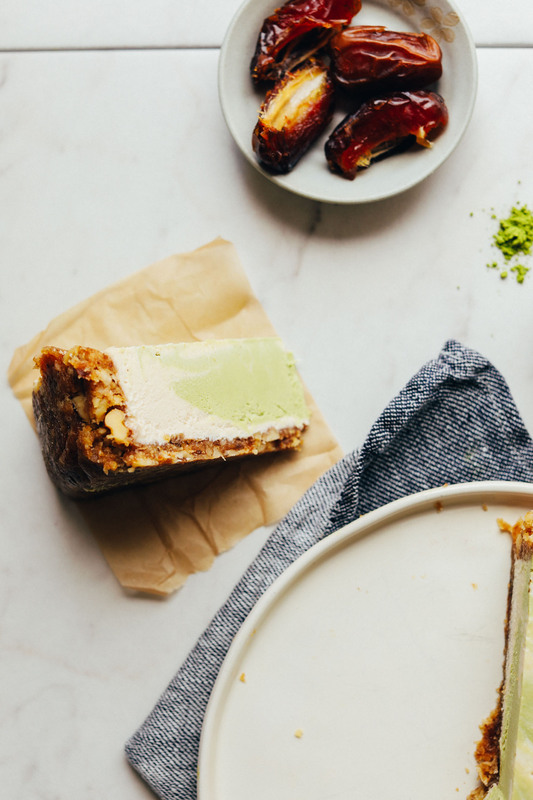 *Want more matcha recipes? Check out my Matcha Green Smoothie Bowls, Mint Matcha Shamrock Shake, and Best Vegan Matcha Latte! We have made your cheesecakes a dozen times we are truly grateful for the Recipes you provide! We recently found out our son can not have cashews is there another nut that will work? Hi Melissa, For the cashews, that’s a tough one. We did try macadamia nuts and didn’t love the texture – didn’t get creamy enough – but the taste was awesome. So that’s an option. Otherwise, maybe try subbing something like hemp seeds + vegan cream cheese? Let us know if you do some experimenting! I bought a food processor and made this for it’s inaugural run. It was also my first attempt at a vegan dessert of any kind. Success on both fronts! This is delicious and very easy to make. I will make this one again. I’ve made a bunch of your recipes lately, and they ALL are absolutely amazing! I love this cheesecake! Thank you for your work. Hello! This looks amazing! If I don’t like coconut or almond, is there anything else I can substitute the coconut ingredients with that you can recommend? Thank you! We haven’t tried this, but would recommend the following. You could use refined coconut oil (it doesn’t have the coconut taste that unrefined does). For the coconut milk, you can sub any dairy-free milk of your choice and for the coconut yogurt, you could sub vegan cream cheese. Hope that helps! This looks amazing and I would like to make this for my boyfriend’s birthday tomorrow – but we don’t have a food processor. Do you think chopping the dates by hand will lead to the desired consistence of the dough? Hi Valeska, we haven’t tried that and don’t think it would work well, but it’s a possibility! If you give it a try, we would love to hear how it goes! This was SO good!!! I made it for a dinner party and everyone loved it! The date crust is amazing! I used 1-1/2 tsp matcha as per suggestion and it was perfect. Also FYI, since I don’t have a high speed blender, I used my food processor. I processed the filling for a good 7 minutes as per the cashew cream cheese recipe on this site, and it turned out just fine. So don’t skip this recipe just because you don’t have the fancy blender! Thanks so much for the lovely review and for sharing your experience! I have now made this 4 times and ended up ordering the pan you suggested because I know I am going to be making this on a somewhat regular basis for the rest of my life. IT IS SO GOOD!!!! There is a teashop in Asheville, NC called Dobra that sells a match cheesecake that I tasted a few years ago and have dreamed about ever since. This is even better than that one. Thank you for another stunner, Dana. You are the BEST! I am going to make this for the second time tomorrow. IT IS SO GOOD!!! There is a similar cake at Dobra Tea House in Asheville which I have dreamed about ever since tasting it a few years ago. Now I can make my own! Thank you Dana – this cheesecake is a dream come true! Hi Kim! Once this cheesecake has been frozen, it can be stored in the refrigerator up to 3 days, but it will become quite soft. For this reason, I recommend storing it in the freezer and setting out for 15-20 minutes before slicing/serving to enjoy the best texture. Store leftovers in the freezer up to 1 month or the refrigerator up to 3 days! I don’t know how your’s came out so white… my mix is light brown and when you mix the matcha in it’s a horrible color. I guess maple syrup is no t the best idea for this recipe. Hi, could I substitute coconut yogurt for something else? More coconut milk for example. I made it twice ! So yummy and easy. I cut the number of dates to 5 and sprinkled a bit of cold water while pulsing to bring it to the right consistency. I make vegan food for my 21 yr old son and he does not like it very sweet. I subbed maple syrup with 1/2 tsp stevia powder. Crust was a mix of raw almond and walnuts and I mixed some soaked Irish sea moss for a gelatinous texture. I am a big fan of Dana and I have shared the blog recipes with several patients of mine who are afraid to try vegan ( I am a dietitian ). Thank You Dana for creating masterpieces – I have one of your cook books too. You are the best! Ekkk…I soaked the cashews 2 days ago now and rinsed after the soak time but have been in the fridge…thoughts? Do I need to soak new cashews or could these be ok? Hi Chantelle! Soaked cashews keep for about five days. After that, they may begin to turn a shade of dark brown and start to taste a bit bitter. Hope this helps! Excellent post. I used to be checking continuously this weblog and I am impressed! Very useful information specially the ultimate part :) I care for such info a lot. I used to be looking for this certain information for a long time. Thank you and best of luck. Delicious!! You can’t taste the coconut too much, and the flavor combo is perfect. It will get soft quickly after taking out of the freezer, but I ADORE this recipe!! Hi, if I’m using regular dates instead of the medjool, do i need to soak it first? You shouldn’t have to, no! I wanna make this tonight….but i don’t like the taste and texture of cashew cream. 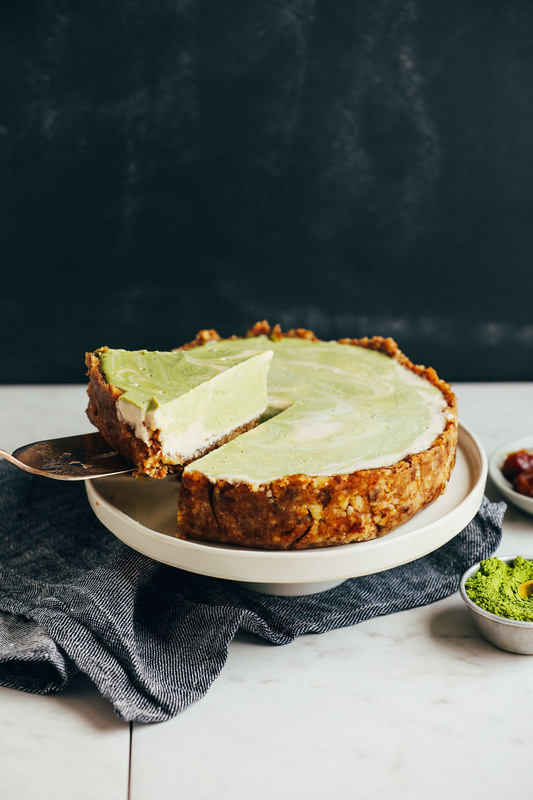 I saw your other basic vegam cheesecake recipe that uses a mix of cream cheese, cashew and coconut milk (i would rather leave it out, too expensive and i don’t like the taste in drinks or other things) that is BAKED so it doesnt taste and melt like ice cream….could i bake this whole matcha cheesecake too if im using the mixed base from the other recipe, and the matcha swirl?? How long, and how long do i freeze it after? Thanks!! Hey! Would this recipe work with raspberries instead of matcha? We haven’t tried it, but I think that could work! Looks amazing, I want to make it for a friends birthday but I will have to travel to her, so it’ll be out of the fridge for about 4 hours. I’ve never made vegan cheesecake before – any idea if it will collapse/melt on my way? May I know what brand of coconut milk do you use for this? Thanks! Hi Julia! It is supposed to be melted coconut oil! Is there any part of this can be done ahead? How long is too long to “chill” in the freezer? Of course I want it to taste its best, and I know that usually happens when things are fresh, but I will be making this as birthday (cheese)cake and will be running around for most of the day beforehand. Hi Jen! You can keep it in the freezer up to 1 month, but is best fresh within the first couple of days. As for making ahead, while there is not any particular steps that you can save time by doing ahead, you can always make it ahead + freeze for later! Great recipe.. super easy to make. I put a little more Matcha powder in there because I like the strong flavour. Topped with a raspberry sauce. Delicious! I have since shared your recipe with a lot of friends and everyone is so excited to try! Thank for a beautiful and delicious blog! Ps. We found it most delicious after approximately 1-2 hours of defrosting. Ever since you posted this recipe I couldn’t wait to make it. Followed your recipe to the T and it’s such a perfect balance of everything. Very delicious and my man loves it too. No doubt this will be one of regulars as many of your other recipes. I made this and it’s delicious! I messed up and omitted the coconut oil but it still worked and froze. My teenage son said it tastes like key lime pie and it does. I didn’t have dates so I used a vegan pie crust I had. Do you have any suggestions for making this recipe tree nut free? Hi! My partner is allergic to all nuts and has strong reactions to dates. Any substitutions you can recommend for the crust and filling (I saw the one suggesting vegan cream cheese)? oh me oh my this looks divineeee!!! Hi, I am not fully vegan, how much honey can I add to substitute maple syrup? Hi Alina! You can substitute it for the same amount! amazing! Seriosuly, when i tried the filling i was so surprised and happy! Cheesecake with 7 grams of protein and utter sweet and refreshing deliciousness? Ooh la la, sign me up, dear! Do you know if this recipe works with a dry sweetener or maybe even dates as a sugar substitute? This looks delicious! I am all about bringing things that no one thinks of as ‘vegan’ to any sort of soiree. Haha. Sad but true! Matcha all the way! Also, I’ve never commented on your blog before but I just wanted to thank you for being one of my primary inspirations for starting my food blog 2 years ago. I’d been doubtful as to whether or not I could do it and honestly, it’s been one of my happiest and most fulfilling hobbies ever! Inspirational for sure. You’re awesome! Many, many thanks! Hi there! Thanks for the request. I don’t know that I’ll experiment with seitan anytime soon. I eat mostly gluten-free and one of the key ingredients in seitan is vital wheat gluten. I’ve also been limiting processed non-fermented soy where I can. But if I find an alternative way I’ll add it to the list! Hi! I made this last night and it came out delicious! So easy and actually can kind of healthy. I’d been wanting to tackle a vegan dessert like this and I’m happy to have had success on my first try. I love your website and everything I’ve made so far! Thanks! Is this very matcha forward? I’m hesitant that with the swirl it won’t be very matcha tasting (I love desserts that really taste like a matcha latte.) Every once in a while vita cafe does a special matcha cheesecake that has nice matcha punch – I’m missing that. Should I go with the recipe as is or increase the matcha slightly? I’d say start with a small amount and gradually work your way up. This definitely tastes like matcha, but the brand I used is high quality (not bitter), and it balances perfectly with the lemon, coconut, cashews, and the date crust. PS–Thanks for the almond option for the crust (allergic to walnuts too)! For the cashews that’s a tough one. I did try macadamia nuts and I didn’t love the texture – not got creamy enough – but the taste was awesome. So that’s an option. Otherwise, maybe try subbing something like hemp seeds + vegan cream cheese? Let me know if you do some experimenting! Of course! Vegan cream cheese! I’ll give that a try. Thanks so much, Dana. ? I made this tonight. It is so incredibly delicious. Thanks! I used 1/2 walnuts and then 1/2 almonds for the crust (since the recipe says almonds can be substituted). I also used only about 1/2 teaspoon of matcha. I loved the flavor so much before adding it that I was afraid I wouldn’t like it as much with all the matcha, although I think next time I would go ahead and try it with more. Thanks again! In the crust you can easily sub almonds, pecans, or even oats! (or a blend). I could also see shredded coconut working well, too. This looks incredible! I love that you have been including oil free options of late! Many of you seem to enjoy oil-free options, and I love including them where I can! Soak ’em! Put them in water in your fridge overnight or in boiling hot water for 45 minutes. They’ll be soft enough for most blenders then! This looks delicious! Would macadamia nuts work in the place of cashews? 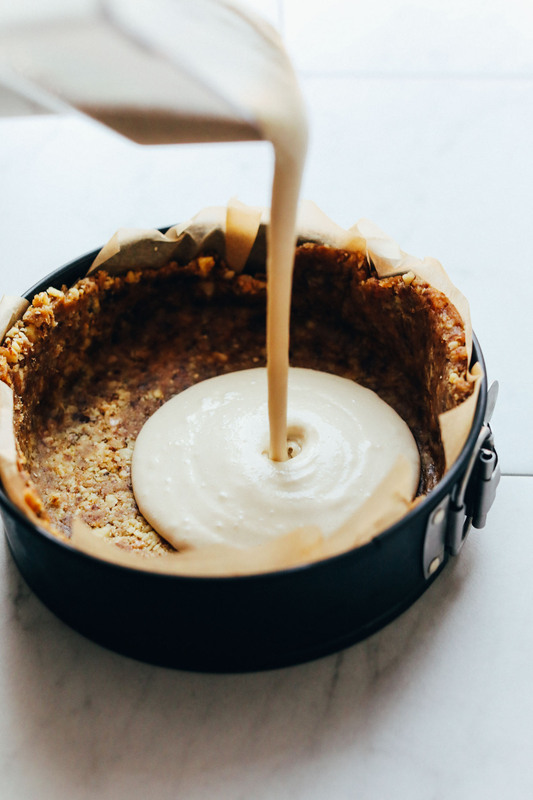 I am sensitive to cashews but would love to try to make a vegan cheesecake! I tried that and didn’t love the texture. But the flavor was nice. If you try it let me know! Looks so delicious. Is it very coconut tasting? If so, is there any substitute for coconut? I love matcha but hate coconut. If you aren’t into coconut, make sure your coconut oil is refined (less coconut flavor) or use avocado oil. And sub almond or rice milk for the coconut! Can I substitute cocoa for the matcha? 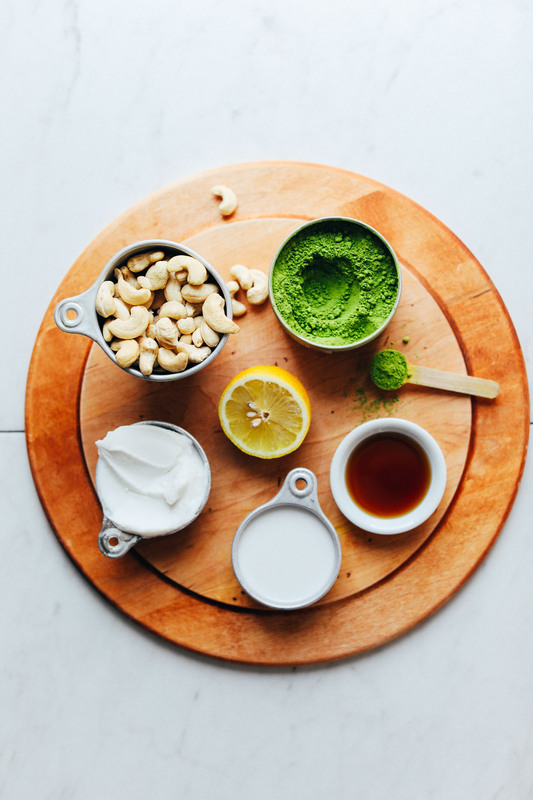 I really don’t like the taste of matcha but want to try this recipe! Sure! You can use this recipe as a guide. Okay so I followed this suggestion, and the result is an amazing chocolate ice cream cake with a great crust! But I’m wondering if the lemon is necessary in the filling? It’s throwing me off with every bite. I also didn’t have medjool dates so I used regular pitted dates. It tastes fine, but I was also wondering what the difference is? If you arent a fan of the lemon, leave it out next time! As for dates, medjool have more of a ‘caramel’ flavor but both can be used. Looks delicious … wondering what the texture is like? Matcha is pretty trendy right now. I just bought some matcha powder, so this is perfect timing.